In accordance with completion of degree it is mandatory to do a practical work in any organization assigned by university to candidate is known as internship. Some big industries also provide internship opportunity to the student enrolled as well as to the professionals who have completed their degree. Telenor which is Telecommunication Company also provide opportunity to young professionals to learn from such a big plate form. Telenor is one of the leading telecommunication companies in Pakistan. Every year Telenor announces internship program and this year also Telenor announced the summer internship program to the willing candidates who have just completed their degree and are willing to gain some practical experience so here comes a big opportunity for them. It is a paid internship program for the people who want to get skills in professional fields of life. Post graduate and graduate students can apply against particular field. Those you want to experience in following fields can apply. The different fields include HR, Financial Operations, Software Engineering, IT, Sales and distribution, Financial Operations and many more fields. It is an 8 week internship program where the individuals will get compensation according to their efforts. 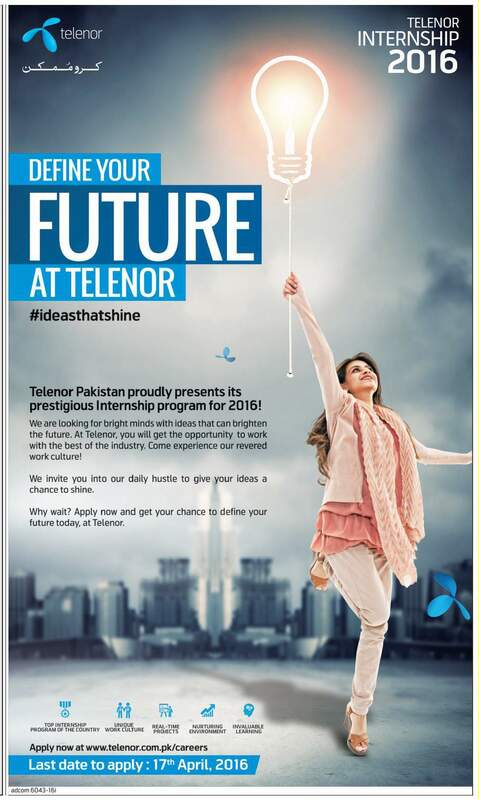 Usually Telenor offers summer internships in April, internship duration varies from 6 weeks to 8 weeks. Those individuals who have already passed their graduate or master degree can apply for the program. This internship is open to all the major cities of Pakistan. If you are willing to participate in this internship program then it is necessary that you should create your profile on the official website of Telenor and apply on the desired position till 17th April, 2018. If you are a passionate person and want to take your practical career to the next level then it is recommended that you should do internship of one of the leading telecom companies in Pakistan.